We hear that ‘a superstar conductor’ is about to be named music director of a no-expense-spared festival and they’d like us to be present at his (sorry, Mirga) coronation. We just had a few more spots open up last minute and would like to invite you to join us this Thursday, August 2nd to cover a press conference in the Swiss Alps at the Verbier Festival, where the Georgian based Tsinandali Foundation (TF) and founders of the Verbier Music Festival are unveiling their new 100 million dollar project entitled Language of Music (“LOM”), and announcing details on their 2019 large-scale classical music festival in Georgia. Flights and hotel (3 nights) accommodations are provided in Verbier, but please let us know ASAP if you are able to join us as space is extremely limited. On Wednesday we are flying select journalist to Verbier to cover the press conference at hotel Chalet d’Adrien, and would love to have you join us in this stunning resort town where we will be announcing the 2019 Tsinandali Classical Music Festival program and the festival’s world renowned new music director. Below is a tentative agenda for August 2nd, as well as details on the “Language of Music” project. Please let us know if you are interested in attending and we will work to coordinate your travel arrangements and itinerary right away. Er, that’s still no thanks. We’ll name the music director shortly. I think investing $100m to promote music in the emerging region is a bold move and should be celebrated not discouraged. It takes money to build new destinations and bring world class music there. Sounds like a great project! 100 Mio (US?) is a one heck of a lot of pork. Who is providing it? There must be some nice shavings falling off here and there for the inner circle. Think of 1% even. Mouth-watering. The historic village of Tsinandali in Georgia’s famous wine-making province of Kakhaeti will soon be home to a large-scale, classical music festival. The Georgian National Tourism Administration (GNTA) of the Ministry of Economy and Silk Road Group signed a memorandum of understanding today, hoping to launch a high-quality music festival that will be known by the name, ’Tsinandali Festival’. Silk Road Group is a leading private investment group in the South Caucasus and Central Asia. According to the memorandum, a concert hall for 900 guests, a 60-room hotel, an open amphitheatre, a library, a conference hall and multi-functional facility will be built in Tsinandali to accommodate the festival and other events. Why go to a Swiss mountain top to promote a festival in poor Georgia? Why spend Georgian funds that way? 1. 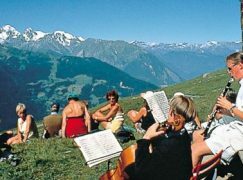 Because the Verbier Festival is currently ongoing and offers an convenient platform to present and advertise a future music festival, even if it will take place elsewhere. 2. Some of the private sponsors of the Tsinandali Classical Music Festival are also sponsors of Verbier/work in Verbier/live in Switzerland during this time of year. Georgian funds aren’t spent on the crowd in Switzerland but will be spent for the music festival itself. The PR matter in Switzerland is being sponsored by the Silk Road Group and (I believe) Martin Engström. You may not approve of their spending but as private parties, it is of course their prerogative to (law-abidingly) do as they please with their own money. Looks to me like Georgian elites partying (avoiding taxes) while Georgian people struggle. Name one country on earth where it isn’t the norm for a fair few of the rich/elites to party (and avoid taxes) while many ordinary people struggle. There is bound to be an abundance of more lucrative schemes and exploitations for certain elites to engage in than a classical music festival in Georgia. … and hiding money that was part of the wealth of Georgian SSR. And how is that different from Verbier? The rich partying and the poor struggling? Every day people, who are very poor and want to be a bit less poor, are drowning in the Mediterranean. Sure, but wouldn’t the GDP per capita be raised in the long run through such investments? Jobs will be created. Tourists will come and spend more money. Isn’t that money better spent that way, rather than hidden in offshore funds and yachts in Monte Carlo, where the people of Georgia will not even benefit a fraction from it? And you still believe conductors (even the ones you consider to be ‘holy’) don’t regularly accept brown bags full of cash? Does the Tsinandali Foundation support music education? Why the negativity? Georgia is a beautiful country and if this foundation can invest so much money in a festival it’s certainly worth a visit. I visited Georgia in September 2017 and also went to Tsinandali – a beautiful part of the country. This is basically the Chavchavadze estate, on which the open-sided concert hall is already built. You may recall (especially if you are a Medici.tv viewer -it was live-streamed), that Zubin Mehta took the IPO there in early September 2017 (unfortunately, I just missed them) for their inaugural concert, with pianist Khatia Buniatishvili as soloist. The estate covers a goodly large area and also includes a vineyard, where their most famous white wine is produced. The wine-making tradition goes back several centuries in that area. There is also a beautiful and mature arboretum with many specimen trees planted in the 19th century when Alexander Chavchavadze made this, his home, the center of the Georgian literally and musical intelligentsia. It is now a state-run organization, as far as I could find out, and a very popular – local and international – tourist destination. Robert Mondavi spent this amount to built, restore concert hall in Napa valley, UC Davis. Another patron built concert hall at Sonoma state university more than 100m. It’s plausible amount for wine and IT money generating country. It produce high quality cultural life here. But for starving Georgia it’s extravagant. This country bread and worship J.Stalin, never denounced his atrocities. Dear Esfir, you meant Russia – where he came to power and where president Putin thinks Stalin “was a successful manager” – not Georgia which had fought Stalin for 3 long years before being conquered and is in war with Putin Russia right now. Get your act together. You would have to pay me more than $100M to visit Georgia in the summer. Atlanta is hot and humid that time of year.